Television is a great babysitter, but growing children also need more creative diversions. 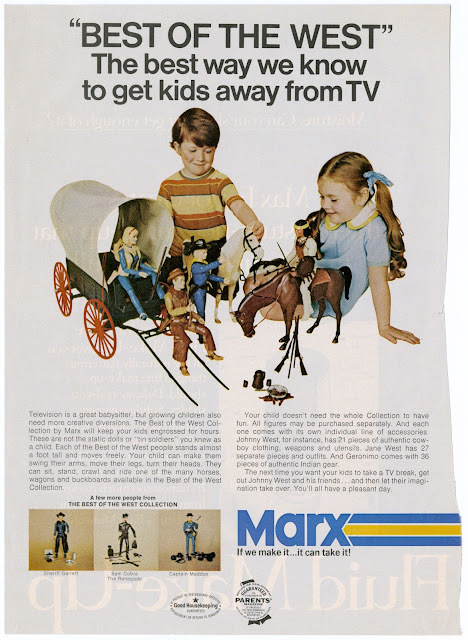 The Best of the West Collection by Marx will keep your kids engrossed for hours. These are not the static dolls or "tin soldiers" you knew as a child. Each of the Best of the West people stands almost a foot tall and moves freely. Your child can make them swing their arms, move their legs, turn their heads. They can sit, stand, crawl and ride on of the many horses, wagon and buckboards available in the Best of the West collection. Your child doesn't need the whole Collection to have fun. All figures may be purchased separately. And each one comes with its own individual line of accessories. Johnny West, for instance, has 21 pieces of authentic cowboy clothing, weapons and utensils. Jane West has 27 separate pieces and outfits. And Geronimo comes with 36 pieces of authentic Indian gear. The next time you want your kids to take a TV break, get out Johnny West and his friends... and then let their imagination take over. You'll all have a pleasant day. If we make it... it can take!